As fake and one-sided as Stan's toupee, but also just as entertaining. 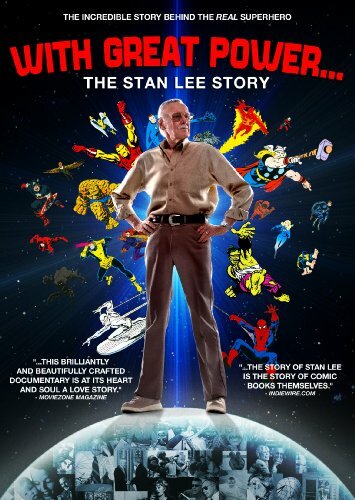 There is a moment during With Great Power…The Stan Lee Story in which Stan, retreading a well-worn adage regarding the history of Marvel Comics, remarks, “I’ve said this so often and in so many places that it might even be true…” Perhaps no other statement so succinctly sums up both the documentary and the man. An entertaining, if unbalanced film, With Great Power… offers a superficial and often sycophantic look at one of the true legends of the comic book industry. The film traces Stan’s roots in the business, from his days as an impoverished youth to his job working as a gopher at Timely Comics. After a stint in the Army, where he was classified as a playwright, penning training films and anti-VD pamphlets, Stan returned to the States and married the love of his life, Joan Clayton Boocock. The two remain together today and a good portion of the film focuses on their lives together. Stan and Joan are more than happy to play the roles of curmudgeonly old duffers, constantly bickering and mugging for the cameras. While there’s no doubt that their love for one another, as well as their feisty attitudes (they can’t even seem to agree about how often they get in arguments) are real, there’s also a pervading sense that these two are born of the carnie tradition - consummate showmen who are always “on”, even when seemingly letting their guard down. Still, some of the most enjoyable parts of the film are the two recounting how they met and fell in love. Joan tears up when reading a corny poem that Stan wrote on her birthday years ago and the two positively beam when discussing their daughter. There’s a brief scene in which we learn of a child they lost after only one short week of life. It’s a rare moment in which we find the usually jovial Lee rendered speechless even after all these years, and a tragic look behind the curtain of a man who typically displays an attitude more in line with carnival barkers and hucksters. Unfortunately, this is one of the few moments of the film that feels completely genuine. Naturally, most of the movie focuses on Marvel Comics and their rise to dominance. While history is, for the most part, presented in the order in which it happened, a few liberties are taken with the chronology in order to present a more engaging story. It’s not a huge issue and nothing in the film is inaccurate, but it’s a bit odd to hear the story of how Jack Kirby left Marvel to work for their Distinguished Competition, only to return a few years later followed by a retelling of Fredric Wertham’s comic book witch hunts of the 1950s - all of this before we find out about how Stan’s wife inspired him to write Fantastic Four #1. Of course, this isn’t the story of the comic industry, but the story of one man’s place in it, so a few liberties are to be expected. But again, this is Stan’s movie; not a history of the medium of comic books, so it shouldn’t be surprising when most of the emphasis is placed on him. And in some ways, With Great Power… almost seems to attempt to act as Stan’s apology to the men whose contributions have been so sorely underrepresented as he gives high praise to artists like Jack Kirby and Steve Ditko. Unfortunately, these moments are far too brief and quickly swept under the rug in order for the filmmakers to continue to heap praise upon Stan Lee and retell stories we’ve all heard a million times before. And that is where With Great Power…The Stan Lee Story fails to live up to the responsibility that falls upon its shoulders. It is an excellent movie, complete with stunning animations and a wide range of contributors from the world of comics, music and film, but it fails to tell us anything we don’t already know. There’s really no new information presented in this documentary. No insights that we haven’t already learned from reading Stan’s Wikipedia page or watching older documentaries on AMC or the History Channel. While there can be no doubt that With Great Power… ranks among the best Stan Lee or Marvel Comics documentaries produced, if you’re already familiar with the man and his legacy, you won’t see anything here you didn’t already know. The flipside of that statement is this: if you already know a lot about Stan Lee or Marvel Comics, you still can’t miss this documentary because of the truly astonishing footage peppered throughout. Ever seen film of the Marvel Bullpen in the 1960s? How about Stan Lee on the college lecture circuit? Pictures of Stan in the 1940s, with less hair than he has now? It’s all in there and speaking as a longtime lover of comic books and a student of the medium’s rich history, I got goosebumps when I saw a tinted-glasses wearing, sideburned Stan Lee with shaggy hair and a butterfly collar. The information might not be new, but every picture tells a story. There are over 90 minutes worth of extras on the DVD and for the life of me, I can’t figure out why the filmmakers didn’t incorporate more of them into the film. An extended segment on Stan and his wife was entertaining and seeing footage from Stan’s Hollywood Walk of Fame induction ceremony was also worth watching, just for history’s sake. But by far the best extra was the segment about the fan letters from the early days of Marvel. As it turns out, Stan Lee kept a great many of these letters and the filmmakers managed to contact a number of these now-adult fans via Skype. To hear these gentlemen talk about the early days of Marvel Comics from a fan’s perspective was vastly more interesting and rewarding than anything else the film had to offer and truly gave us insight regarding how powerful and groundbreaking those old comics really were. At the end of the day, I find that despite my complaints, I still have to recommend With Great Power… The Stan Lee Story. It might not present any new information or new insights that we haven’t already learned from other similar documentaries, but it does manage to put it all in one place and with a whole bunch of awesome footage and artwork. Whether you’re a die-hardfanboy, a Marvel Zombie, a newcomer to the world of sequential art or just someone who enjoys a decent documentary, you’ll find something to like on this disc. And while I can’t call it a perfect film, the areas in which it succeeds definitely outweigh the ones in which it fails. ‘Nuff said.